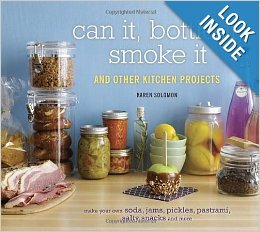 Karen Solomon is the author. The fruit cheese is really a fruit paste. 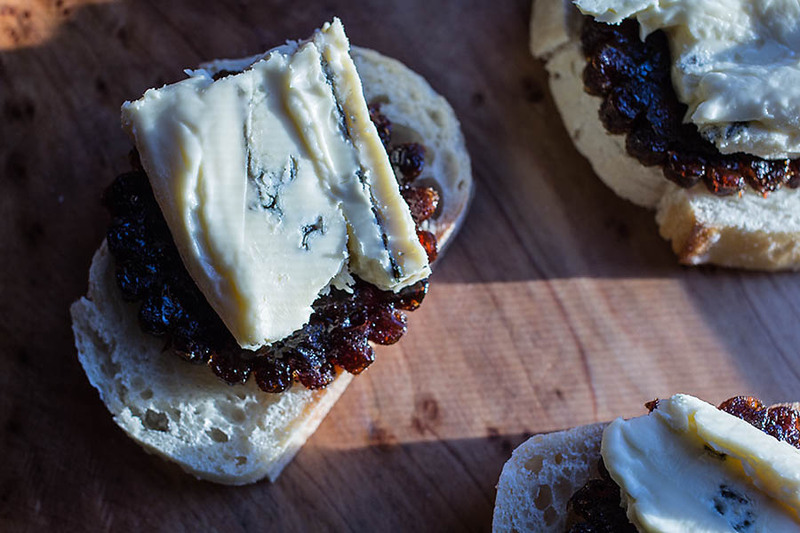 It’s similar to the wonderful quince paste or membrillo that’s served alongside Manchego on a Spanish cheese platter. 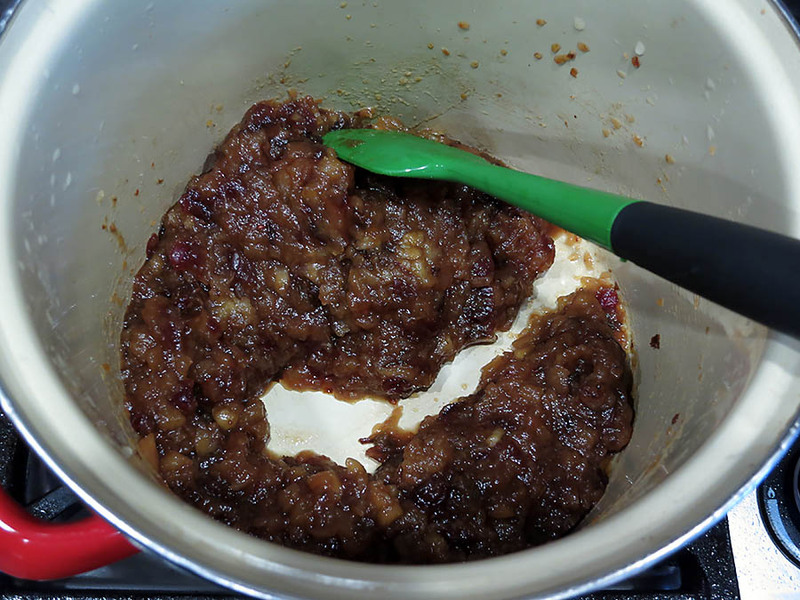 Except that my paste ended up a somewhat different texture to membrillo. Nonetheless, it’s worth making this fruit cheese at least once. There’s no effort involved to speak of, it just takes a few days to complete. Peel and core the apples. Cut them up and place them in a tall pot. Add the pomegranate seeds and diced plums. Then add the water, sugar, and salt. Cover the pot and bring the mixture to a boil. 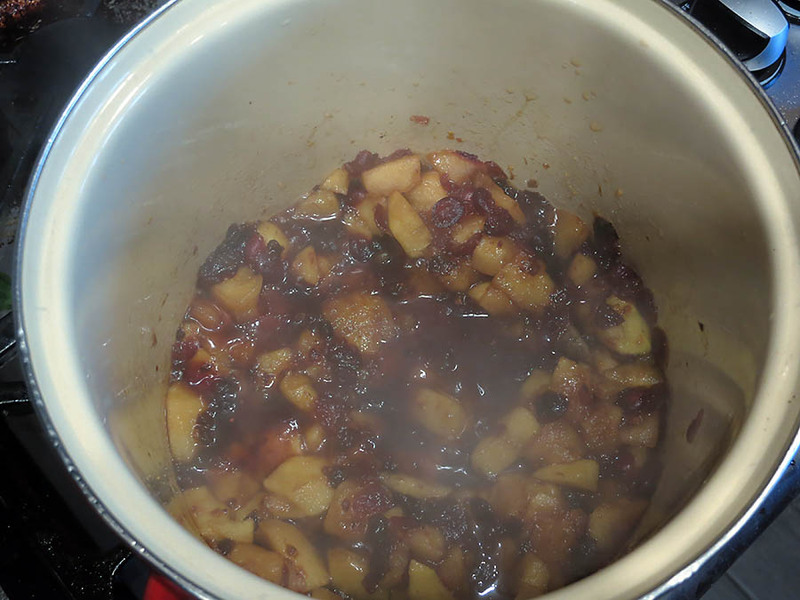 Simmer the fruit for about 20 minutes. 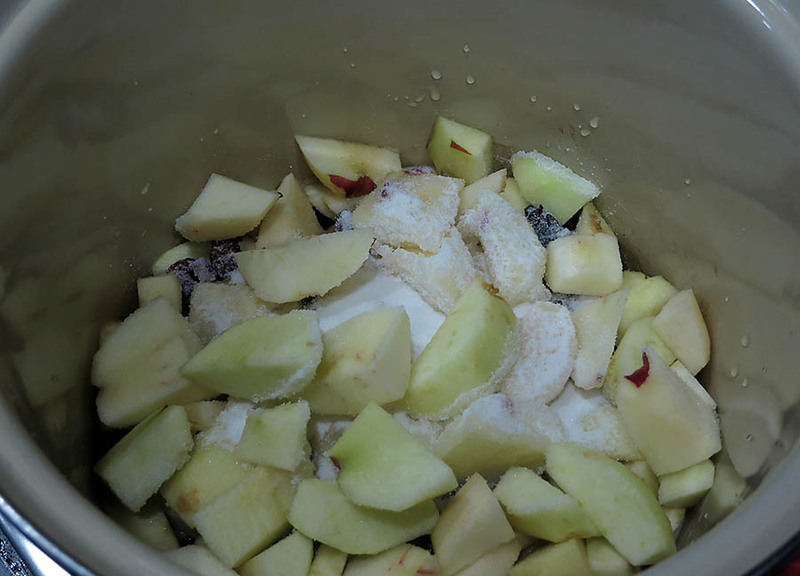 Using a potato masher, mash up the apples. Do this as often as you can to get a nice mush. The fruit has to be fairly smooth. And now that I think of it, I could have used an immersion blender. 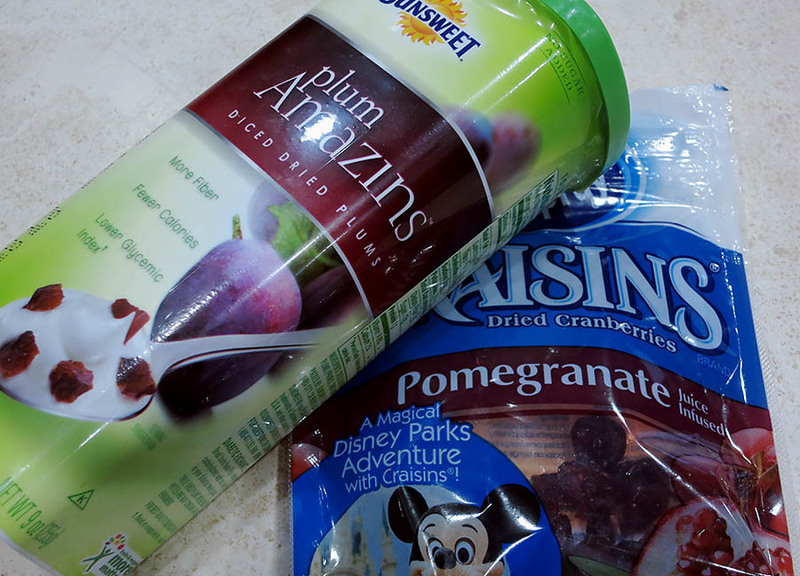 But I think I had it in my mind that I wanted to see the pomegranate and plum part of this fruit cheese. It’s kind of a tedious process, but keep after it. 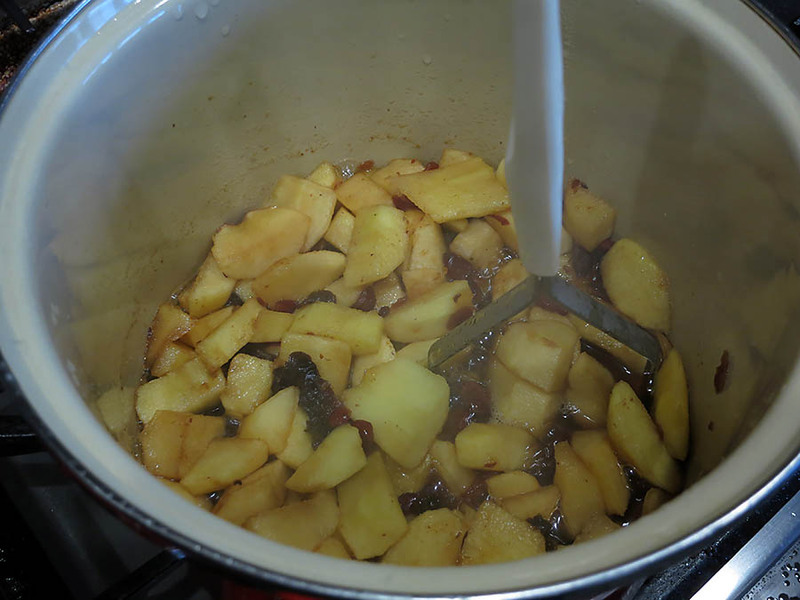 Then continue cooking over the lowest possible heat to remove as much liquid as possible, with the lid off. 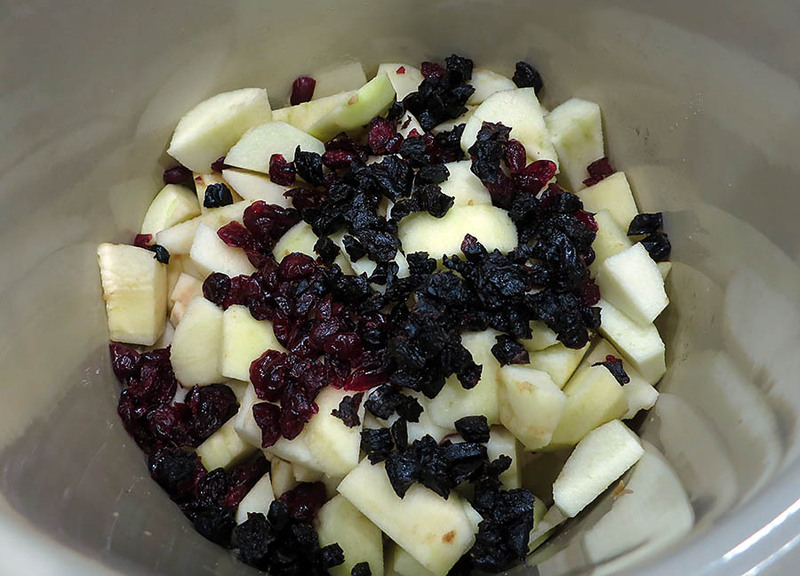 Line a jelly roll pan with parchment paper, and pour the fruit mixture on top. Smooth it out; it should be about 3/8″ in thickness evenly. 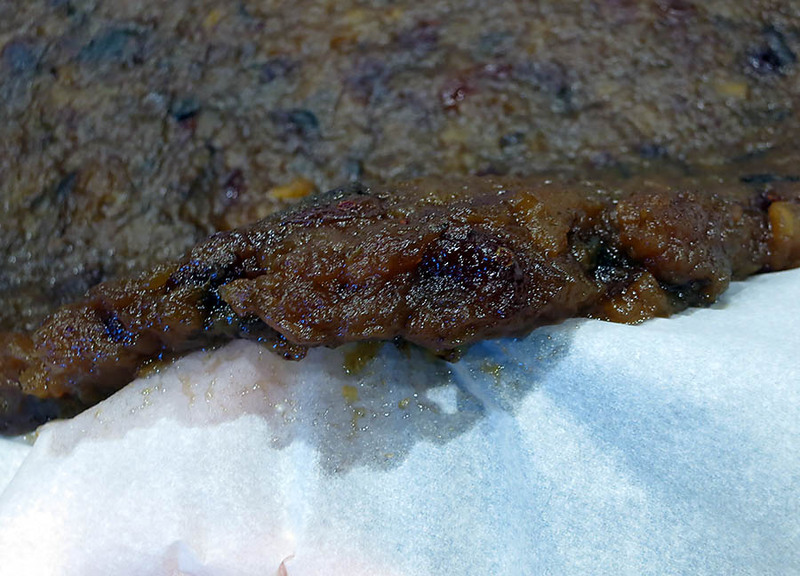 Let the fruit paste sit on the parchment paper overnight. It should be a little dried out. I peeled the paste from the paper and you can tell the paper is wet. 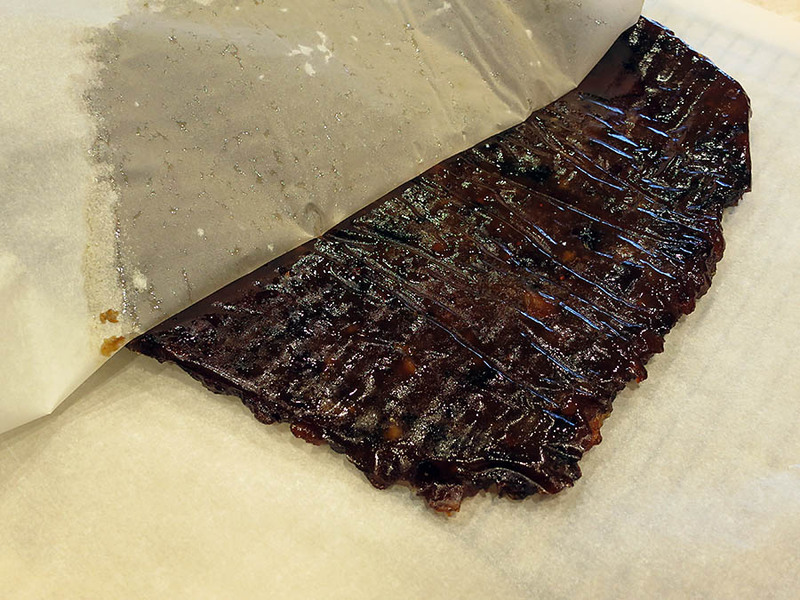 Then place a cooling rack on top of a cookie sheet, and place the fruit paste and the paper on which it’s laying on top of the rack. Place everything in a 200 degree oven for 3 hours. Leave the oven door ajar. The fruit won’t look any different. Let it cool, then let it sit overnight once again. It should be mostly dry. At the point where the fruit cheese’s liquid has mostly all evaporated, but the paste hasn’t been allowed to over-dry, wrap it up in parchment paper and store it in the refrigerator. Supposedly it’s good even after 6 months. The only problem with this recipe, is that there are no accompanying photos. 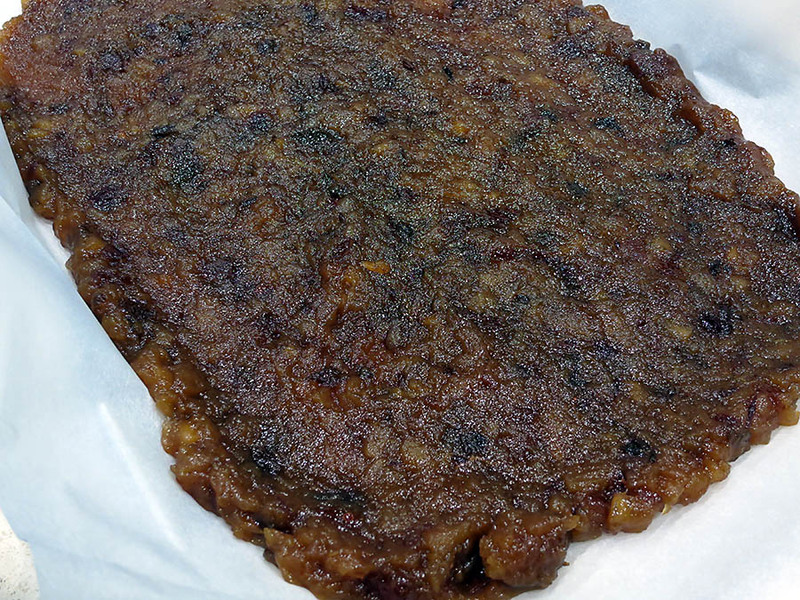 I really wasn’t sure how to serve this slab of fruit paste. Membrillo comes in many forms, from rectangular flats to thicker pie-shapes, so I guess it really doesn’t matter. The point is that the fruit paste is really good with cheese. Just for fun, I decided to use a little scalloped cookie cutter to cut out the fruit cheese. 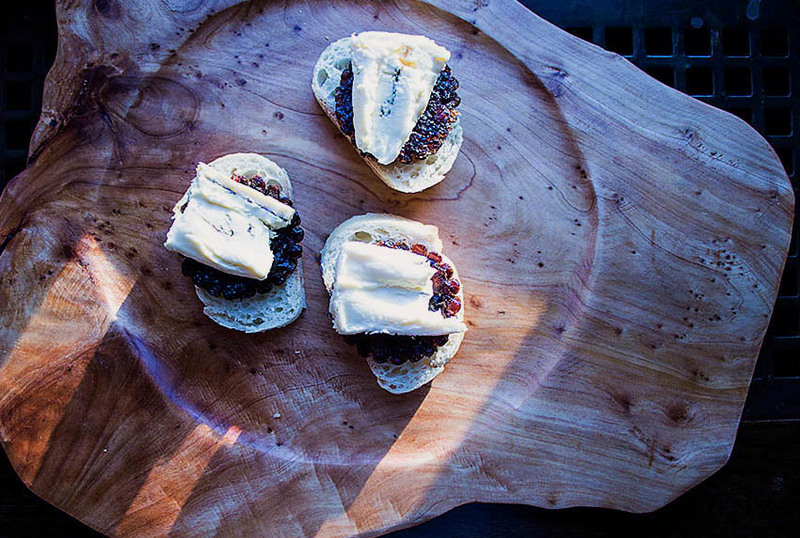 For my company, I paired the fruit cheese with triple creme Cambozola – one of my favorite bleu cheeses. I must say, it was a fabulous combination. verdict: I probably won’t make this again, especially with membrillo so readily available anymore. And there are other fruit varieties out there as well. 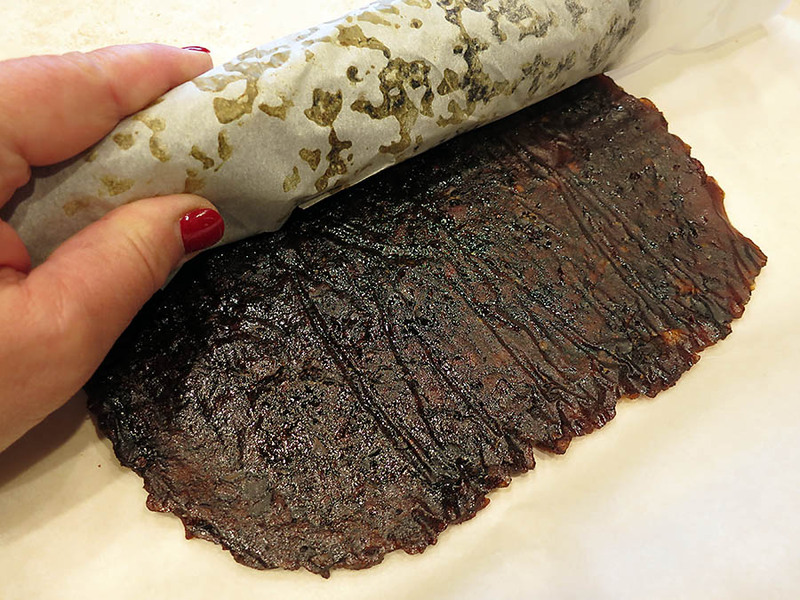 If you have young kids at home, this is a fun way to make what is essentially the equivalent to a fruit roll-up, however. Especially with cheap apples in season. It look amazing… the taste of dried plums, pomegranate and apples with cheese, maybe with a good glass of white wine sounds great! That’s exactly how it was enjoyed! Really interesting! Definitely going to try this at some point. It was interesting! But good! That looks interesting, I’ll give it a go as your photos have me hankering for cheese and membrillo. Have you made those logs of dried figs, raisins, brandy and chocolate that come from (I think) Spain? Those are left a bit chunky but also look like a similar idea. no, but I have to find out what that is!!! I think the scalloped cut outs was genius, I want to try this. Thanks!!! I just wasn’t sure what to do with the fruit cheese slabs! That looks so good, and must be such a good accompaniment to actual cheese?! It’s a perfect combination with just about any kind of cheese. Just a lot of work! Funny that I posted a fruit recipe too! I’ve never had or heard of membrillo. Seems like a huge task to make but It must be as good as it looks. It’s like a soft fruit candy. It is like soft fruit candy, and I probably will buy it next time! I will have to pass this on to my daughter. She is the queen of cheese. I don’t know if you have Wegman’s stores in your area – we just got one last year. Their cheese selection is overwhelming and they will open and let you try any of them….even the $75/lb truffle cheese. I could see playing with different cheese and fruits… nice idea. Whoa, 2 hours for a just a cheese run would be a bit much but nothing when going to visit a daughter – why that’s just a couple CD’s ride. Looks like a lovely addon to plain-old cheese and bread.. plus the idea of dainty cookie cutter bits is genius :) And your board is lovely! Olive wood? Yes. don’t you love olive wood? This is almost like a fruit rollup but the adult version and so much better. I like your added touch of using a cookie cutter so pretty and the perfect little appetizer. Sounds really good – I spent ages trying to explain that fruit cheese really wasn’t cheese at all to somone recently and got absolutely nowhere! Chef Mimi: this looks so very delicious! Yum! Thanks! It was pretty good, just a lot of time! This sounds completely delicious ! Oh my, just wanna go to my kitchen, find some fruits, good cheese and good wine. This makes my mouth watering so hard. I love associating fruits with cheese. I discovered it in NYC few years ago with a beautiful brie cheese + cramberry. It sounds amazing ! That’s you?????!!!!!!! I love that website!! !